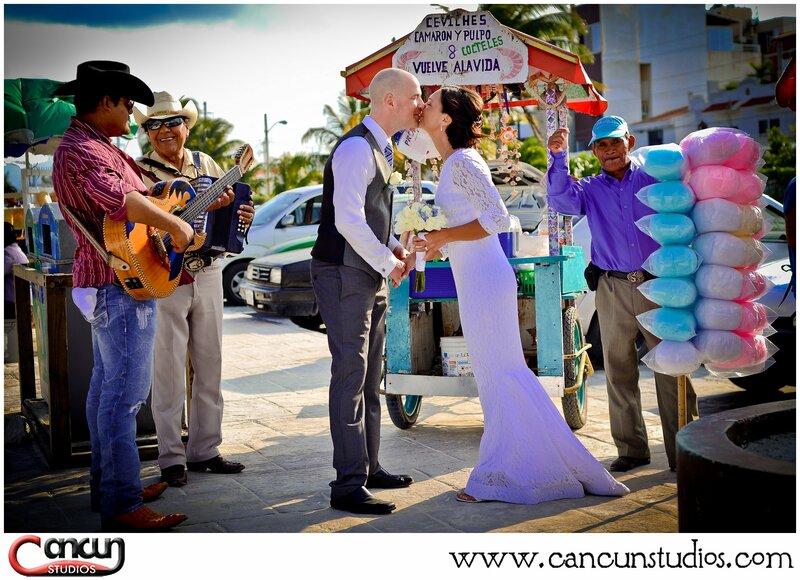 Cancun Studios Photographers » A photo surprise they will never forget! Going above and beyond for your clients! When our Swedish honeymooners first got in touch with us regarding photography for their Trash the Dress session, we were so excited to be of service! The turquoise beaches of Cancun are always a perfect setting for any photo but our clients wanted a little Mexican culture in their photos and they left this task up to us. So we prepared a surprise for them they would never forget! It’s in our nature to go above and beyond for our clients. It gives us a sense of personal fulfillment when we can create a photography experience that will be remembered forever. We work with newlyweds, families and couples from all over the world who come to Mexico to get a taste of our culture, foods, and hospitality. So it’s always a joy for us to share what we can as we did with our Swedish Newlyweds. We set up a full scenario of Mexican flare with a singing duo, cotton candy on a stick, and a fresh ceviche cart.